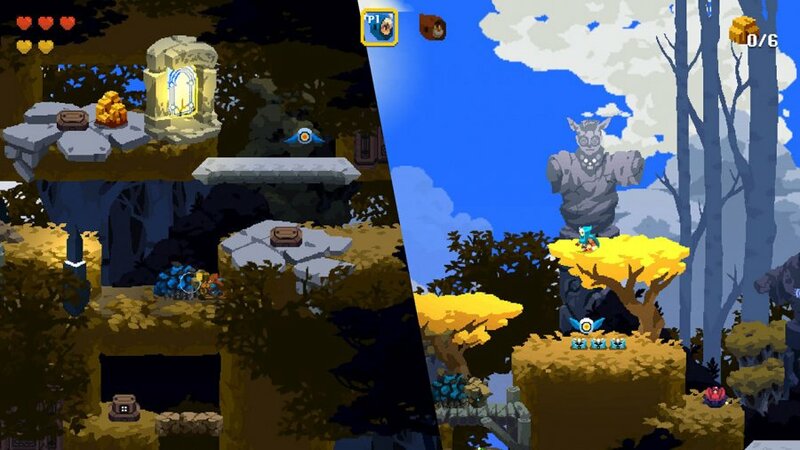 After initially being conceptualized as a graphic novel, Aegis Defenders became a KickStarter game started way back in 2014, promising a unique blend of platforming and tower defense elements. After a successful campaign and a four year development cycle, the game has finally come out, and it was worth the wait. Aegis Defenders is a blast to play whether alone or with friends, proving that these two genres can be mixed in interesting and fun new ways. 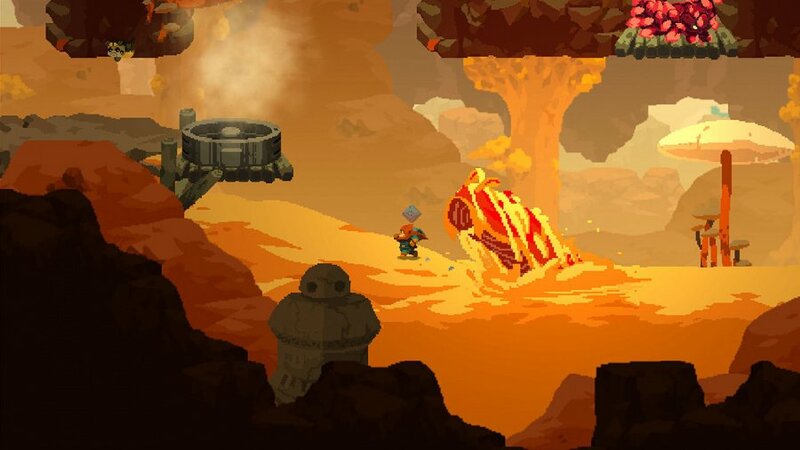 Aegis Defenders primarily follows the story of two Ruinhunters named Clu and Bart, doing their best to survive by picking through the scrap remains of an ancient civilization. Once they find a mysterious robot on a routine day of scavenging, they soon find themselves whisked off on an adventure to fight a menacing empire and save the old gods that once ruled the land. It may sound like a story you’ve heard thousands of times before, but the characters are excellently written and the plot is brilliantly paced. In between chapters, brief cutscenes share a little bit more of the lore and backstory of this mysterious world that you’re dropped into, and the friendly, playful banter between characters keeps things lighthearted in between. Suffice to say, the world feels incredibly realized, and you’ll likely find yourself drawn in by the mystery and cheery sense of wonder that permeates the experience. Gameplay takes the shape of a hybrid platformer/tower defense game, with plenty of customization and strategy elements to boot. The first phase of stages is where the platforming comes in, as you guide characters through a mixture of platforming, combat, and puzzles, to reach the end. Along the way, you must use the special abilities of each character in concert with each other to clear hurdles and unlock secrets. This segues into the second phase—which is rather like a “boss fight”—in which you have to defend a central objective against waves of enemies. Rather than being used to traverse environments and solve puzzles, character abilities are now used in a strategic fashion to fend off the enemies coming at you from various sides. Though initially it seems like it might clash somewhat, this mixture of genres feels surprisingly natural, with both elements proving to be equally engaging. The primary hook of gameplay here is the cooperation element, which places equal weight and importance on different characters. Each character has a color, and do extra damage to enemies that match them, but that’s just the beginning of things. 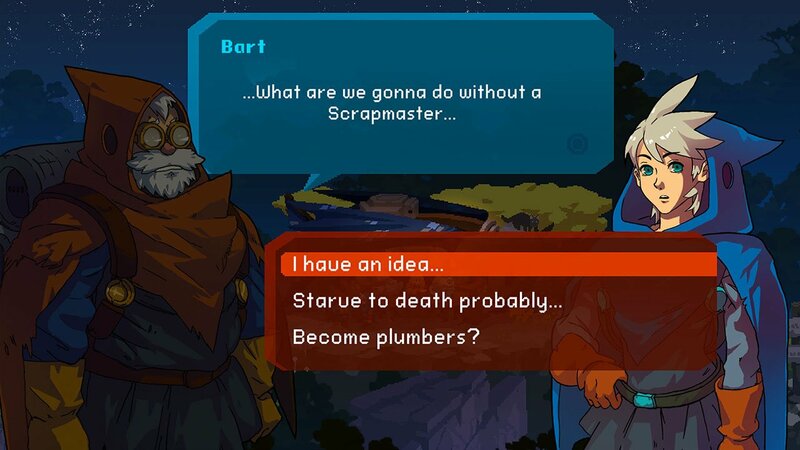 On top of this, each character has a different playstyle—like Clu using a rifle while Bart uses a hammer—and a buildable block item that can be used to solve puzzles and fight enemies. Different characters can then build their block items together, producing entirely new constructs. For example, Clu can make a bomb and Bart can make a basic turret, but when they’re put together, it makes a turret that shoots in bursts of three. Add in a couple more characters and construct combinations, and suddenly there’s a vast array of offensive and defensive items available to you. If that sounds like a lot to juggle, that’s because it is a lot to juggle. Though new elements are introduced at a manageable and measured rate, it can still feel at times like things get a little jumbled when playing in single player. You can only play as one character at a time, so you have to go through lots of button presses and character swapping to achieve simple objectives. It’s not game breaking by any means, but it can be a bit tedious having to constantly select a character, confirm your choice, do a simple action, then repeat the process with another character. Over time, this becomes a matter of muscle memory and the issue slowly starts to go away, but it’s nonetheless an annoyance that might bother some. Aegis Defenders was clearly designed as a multiplayer game, and it’s here that the gameplay truly begins to shine. Having a friend on hand to communicate and strategize with adds whole new aspect of fun to gameplay. Whether it be talking through how to best reach that collectible sitting up on the hidden ledge, or discussing which lanes to defend for the next wave of enemies, you’ll find that going through the campaign with a buddy feels immensely more satisfying. There’s no static split screen either; if you and your friend are separated, the game will dynamically shift the line separating your views as you two do your thing until seamlessly returning to the same frame. It looks pretty cool in action, and really helps to keep you focused on the task in front of you. Given that the Switch allows for this kind of co-op gameplay anywhere with split joy-con support, it’s easier than ever to play a round with a friend and clear a stage or two. 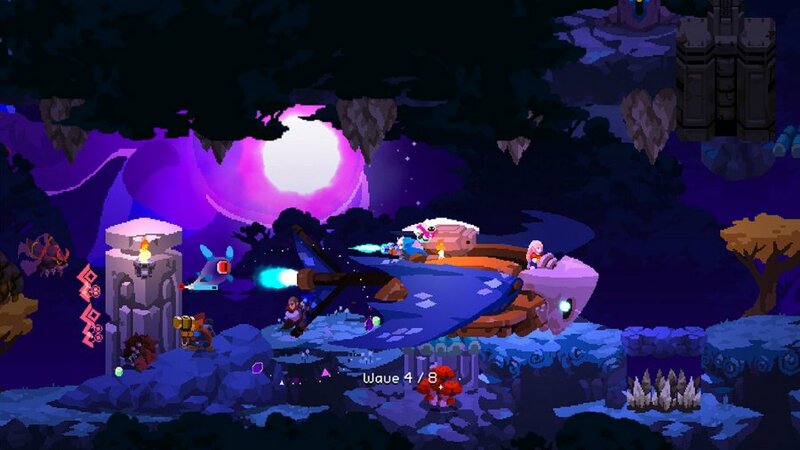 In between levels, spoils obtained from felling enemies and finding secrets can then be spent on customizations and unlockables for your party. Skills can be upgraded, life meters can be expanded, and wallets can be deepened, leading to a satisfying sense of progression as you move from stage to stage. One neat feature that we appreciated—seemingly inspired by Persona—gives players three dialogue options in conversations, with more EXP being awarded depending on if you selected the “right” response. This can be used in interesting ways, too, like managing to haggle down a merchant from charging you full price to giving you the item for free. As expected for scrapper nomads, resources are always short, too, which makes this section all the more involving as you labor over the decision of what should be upgraded before heading out into the field. In case you haven’t noticed from the screenshots, Aegis Defenders is an absolutely beautiful game, and it’s accompanied by an equally hypnotic soundtrack. 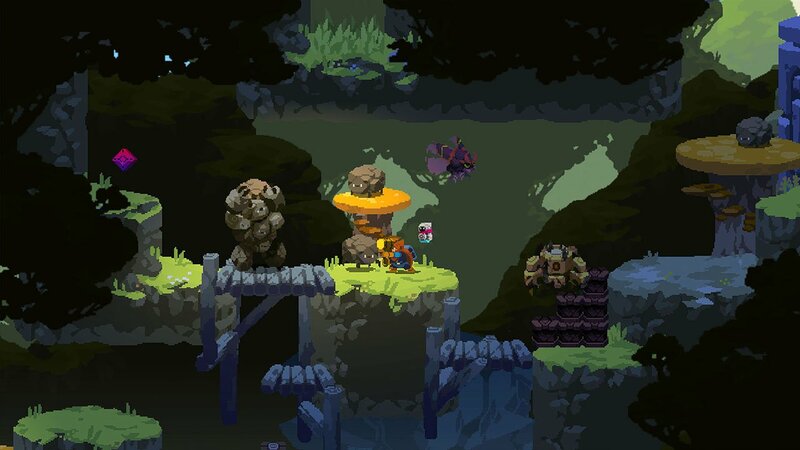 Though it’s nothing new seeing another indie title that uses pixel art, it’s quite rare that you see art as detailed and defined as you’ll encounter here. Every level is positively bursting with color and details like animal activity in the background help to make the world feel like a living place. Action unfurls with buttery smooth animations and the chaos of a battle makes for some serious eye candy. When the team makes camp for the night, the ocean of stars above them is gloriously full of light and you can almost feel the warmth of the fire. Couple all this with lovely, hand-drawn character portraits, and you’ve got a game that’ll have you reaching for that capture button more times than you think. In the same vein, the soundtrack matches the artstyle perfectly. Whether it be a playful piano ditty while you pilot a mech suit that shoots cats or an emotional strings piece while you’re exploring a brand-new area, there’s a childlike sense of optimistic wonderment that’s being reinforced throughout the game. The soundtrack does a great job of setting up the right atmosphere when it needs to, further immersing you in this strange, fantasy world. Aegis Defenders is a fantastic game, brilliantly blending the tower defense and platforming genres in a unique way to produce a memorable and enjoyable experience. Lovable characters, interesting lore, plenty of secrets, engaging gameplay, and gorgeous presentation combine to make this a must-have title for your Switch. We would recommend this to anybody looking for a detailed world to immerse themselves in, or to somebody looking for that next game to play through with a friend. 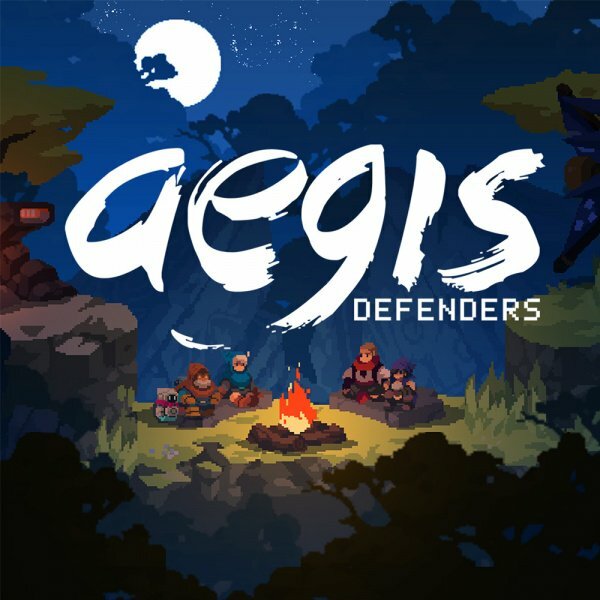 Aegis Defenders is a real gem on the eShop; don’t miss out on this one. I'm going to be all over this. I've been on the fence about this one and all the other reviews I've seen didn't really persuade me in either direction. Maybe I'll just give it a go, got some time to squeeze in a new game while I wait for my copy of Dragon Quest Builders to arrive. @AG_Awesome I haven't commented like, all weekend! Another game I'm interested in. I'm slowly turning my Switch into an Indie machine. This review might just be the thing that convinces me to buy it. I buy A TON of Switch games yet for some reason I've been on the fence about this one. I guess it's because the trailer doesn't look all that appealing to me and even though I have read glowing reviews, I see that trailer in my head as I read them. With all this games I need Nintendo to upgrade the Switch menu to something more friendly instead of going through all the titles until you find the one. I backed this on kickstarter back when I did that. Haven't played it yet, but I'm glad to see it come to fruition. Still waiting on one other I backed years ago. Still looks like too much going on, but then again, I tend to like that. I don't know. Too much to play atm, will grab on a sale though. Definitely checking this one out. In that screenshot Bart really looks like a Studio Ghibli character... can't remember which film though, perhaps Laputa? Love platformers, not fond of tower defense, so...maybe...? Got this Day 1 and was surprised to find Insane truely challenging for once - at least in single-player that is. It's a shame that there is no way to play the Switch version online. I'm kinda regretting not getting it for PS4 now, purely based on the possibility for online-play there. The game itself is quite good I'd say, I ran into a minor bug (charater dropping through the ground), and I feel that some of the interface and control choices feel a bit unrefined, but overall none of this really takes away from the likeable cast, beautiful visuals and solid gameplay. My only real gripe (online aside) is that I think this game would possibly have been better being focused on the Tower Defense section alone. The whole platform aspect of the game feels really basic. It's not bad so much as ... well, comparatively uncompelling to the rest of the gameplay, and frankly, also compared to many other platformers on the Switch. So, all in all, I'd say it's 8/10 - could really use online co-op, a focus on the TD aspect, and some fine-tuning of the interface and control scheme (also, maybe some visual changes to tower upgrades, if we are nitpicking). @Daftbomb Straight up man: This game is brilliant and absolutely worth the $20 price tag. This is the first review i agree with, most of the others I've read must have been reviewers who just didn't fully "get it", cause it is stunning in all areas. I was digging the art and the concept, but some of the reviews had me on the fence but I decided to take a chance and I'm glad i did. I'm already stoked about playing it later and believe me...I don't have tons of gaming time during the week and I have about 130 Switch games I've yet to finish...but this game is going to get my attention for some time. AND it's great you say? Also, I'd still like it very much if you would consider listing file sizes in your info-box for eShop games. @Daftbomb You're not kidding man, it gets even MORE bleak in these terms: 132 games total at the moment. Let's say I dedicate myself to finishing ONE per week. It would take me TWO AND A HALF YEARS to finish all of my current stock. Should I repeat that for emphasis lol?!?! Nevermind the fact that there are metric TONS of games coming up and yeah...it's not looking good lol. In all fairness I AM being ALOT more selective now, when I got my Switch it was July and there was already so much to catch up on that I went a little nuts. Now, it's just keeping up with what I want that is coming out and trying like hell to STOP WANTING SO MANY GAMES THAT COME OUT. Like a lot of indie games now though, I'll be waiting to see if it gets a physical release. I don't wanna buy every eShop game twice. Really not one mention of Shovel Knight being included in this game? @audiobrainiac But the physical game will be a lot more expensive than the download. Funny thing is, If a game gets a physical release at the same time as the download version the physical copy will be cheaper. Wonderboy physical copy is twice the price of the download. Nice! Waiting for them to restock Switch codes so I can claim my backer copy. Caught my attention because the homage to Miyazaki movies, so glad it's turning out great. @zool yeah unfortunately, but if I like a game enough i’ll bite the bullet. I like supporting developers of quality games when I can. Plus this is the only physical collection of games I have room for at the moment. My local game stores trade-in values usually help me out, should there come a time when I’m done with it. I kickstarted this and after who knows how many years its finally out. Unlike other Duds I’ve backed, this one is actually fun. I love the defense tower sections. I’m gonna recommend this one for sure. @Ralek85 I understand that scoring is a subjective thing, but the buyer does rely on the reviewers final score. Nintendo Life does score high which can be misleading. And value for money is not usually considered. @Fake-E-Lee Is there scope for replay in this game? I like my TD games with multiple difficulties and plenty of maps, and is there a fair amount of upgrade options? @Daftbomb Yeah, there's a ton of replay value, upgrades, etc. I can see myself going through this one quite a few times, if anything just cause it's a really great game and also to keep getting better. It feels amazing when you have a "perfect game" on a level and it gets quite challenging. @Daftbomb Right on man! I'll add you to my Friends list in a few, I gotta turn my Switch on to make sure Owlboy downloads anyway. @zool Don't take this the wrong way, but anyone who relies on scores is a fool in my book. Yeah, maybe you're lucky enough to come across a competent reviewer, who uses scores and really shares your taste, in that case, relying on scores might be reasonable. For everyone else, I suggest consulting more than one source, and definitely bother with actually reading the thing, instead of just skipping to the end to gaze at the score, as if that was proper scientific measure of quality. @Oat @PhilKenSebben You both mentioned it was too much and you wanted a sale. This game is on sale right now. @Fred13 Hey. Thanks a lot! @PhilKenSebben No problem glad I could help. I actually came to this page because I saw the sale and wanted to come read the review. After reading the review and some of the comments I just bought it myself so I figured I'd clue you in. There's a lot on sale right now. Demo gave me pretty good idea of the game, and the full version didn't disappoint at all. It delivered exactly what I expected and a lot more. But I encountered severe bugs like freezing during loading, saves syncing only partially, collections not syncing correctly, which really deterred the game flow. The game difficulty between 1 player mode and 2 player mode differed too much. For the 1 player mode, I almost always need a 2nd playthrough for each stage. For the 2 player mode, there was no scaled difficulty, so it was a complete breeze. Otherwise, this was a perfect game!